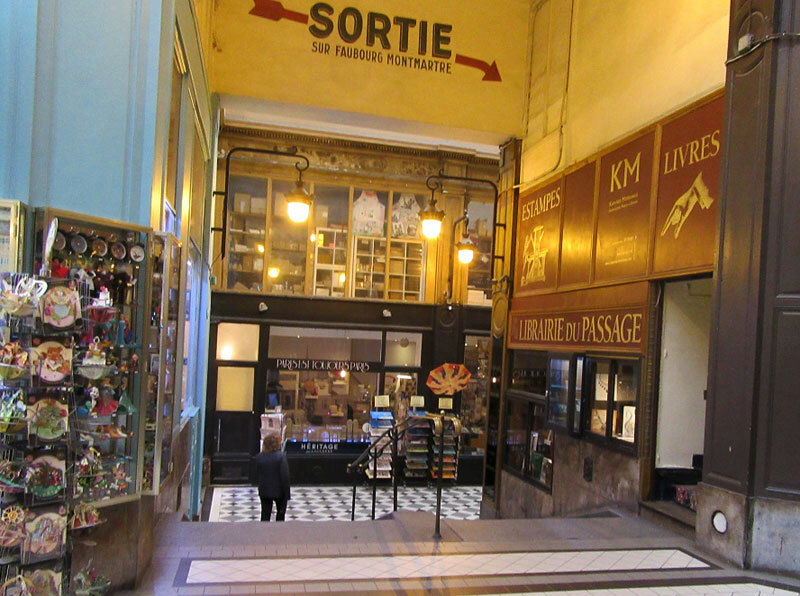 There are around a dozen still trading ancient shopping passages of Paris. Created in the 18th and 19th centuries, they are reminiscent of earlier days of a glamorous Parisian culture, they are a joy to experience. Some of them are sheltered by a glass ceiling, some lie hidden in side streets and some exude a bright, shining and glowing art deco persona that instantly attracts. A few of them are fusty, un-maintained and tatty. They are all a component of an earlier Parisian vibrancy. They have a timeless quality comparable to a vintage Rolls Royce and they are fun to track down. Visitors and determined shoppers will be able to find rare and older remnants and symbols from bygone days of Parisian life in these ancient passages. There are many ‘one off’ items like dusty books that have lain for decades unread and perhaps some bargains. Older furniture and older styles of household goods and perhaps unused clothes rest behind the shadows in some of the stalls and shops. Visitors will find collections of earlier fashions in everything; visual, layouts, designs, tastes and styles. Some of the grander passages provide café tables to use just as people from an earlier period did. The cutlery and tableware remain just as it was so long ago. They are much more than just an imitation of past days, they are as they have always been. Modern confectionary and market style fruit and vegetables are traded in a few places. And there are goods for the connoisseur. This ‘just off the street’ collection of Parisian civilisation is like a little oasis. It’s secluded and strangely private. 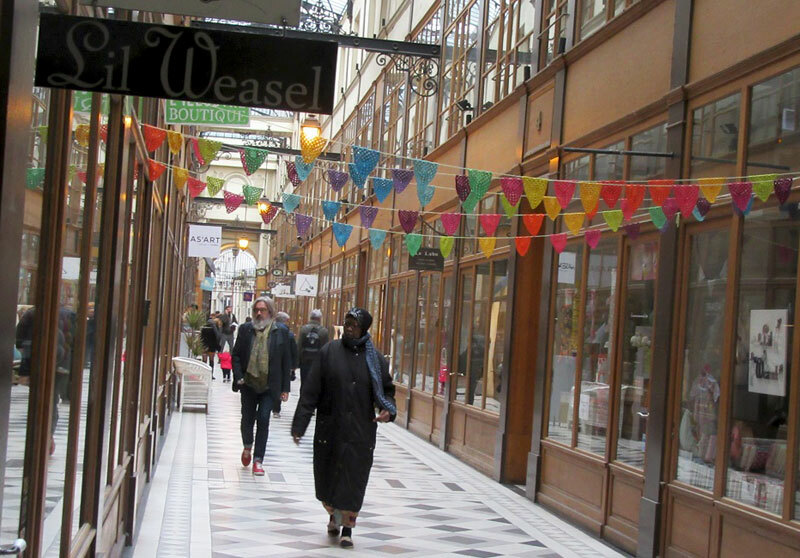 Head to the Faubourg Saint Antoine and have a look the little hamlet-like enclave. Trees, flowers and ivy encrusted buildings surrounded by exquisite architecture harbouring a celebrated art bookshop and library. It is a peaceful retreat from the pace of life in the busy streets. The nearest Metro station is Ledrue-Rollin. 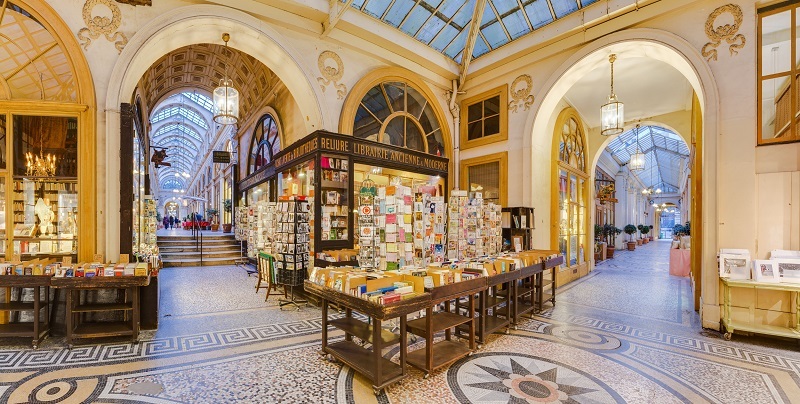 Perhaps this is the most beautiful shopping passage in Paris. It has been restored to its original glory. 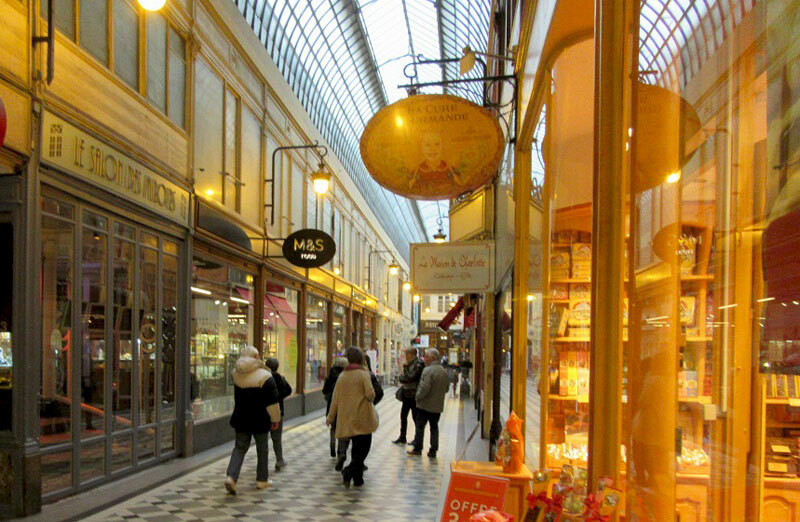 There are many alluring shops and the French scent of Parisian culture fills the atmosphere. You can buy fresh flowers that arrived in the morning from the Rungis market that the stall owner gets up at dawn to go and collect. Look for the designer jewellers discovered by Christian Lacroix, enticing household goods and older style eye wear. When you have finished head for Le Pas Sage wine bar to nourish your soul. The nearest metro is Etienne Marcel. This really is two passages on opposite sides of the road. On one side it’s all about spicy Asian food restaurants. The prices are very reasonable and the atmosphere is one of vibrant commercialism. On the other side of the road there are shops and stalls selling items from India. The best metro station is Chateau-d’Eau. This passage has seen better days but conducts its business vibrantly. Unsupported by national funds it has nevertheless managed to survive the years. The cracked glass ceiling lets in the rain, but it retains its charm. You can find stalls selling vague bric-a-brac and dusty old books. It is exciting and timeless. Nearest metro, Quatre-September. This is splendid. It reflects perfectly its origins from the heyday of the 19th century. There are old fashioned toy shops, antique walking sticks for sale and a vintage photographic gallery. Tempting obscure art books and a hotel will hold your attention too. (Book the hotel well in advance if you want to experience it). Explore Musée Grevin, the Paris version of London’s Madam Tussauds waxworks museum, with the scary Grevin staring back at you. The nearest metro is Richelieu-Drouot. Named after the Theatre Moliere which hosted performances of the great dramatist’s plays. The theatre still exists and this collection of buildings rest alongside an open-air passage. The location is a little scruffy and un-tended, but it retains its charisma. There is a large museum containing rare cinema posters from earlier days. Find also expensive but high quality, made to measure shoes, from the Japanese cobbler Tamano Nagashima. 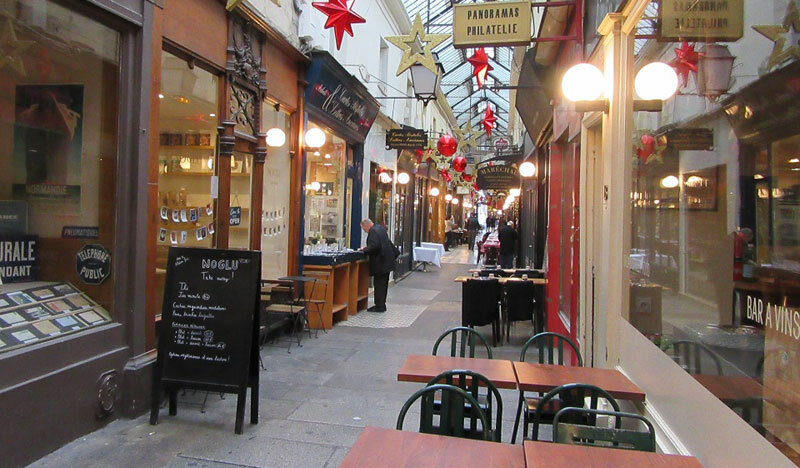 Passage Moliere is modestly charming. Nearest Metro station, Rambuteau. This row of establishments is in a commercial, working district dealing with fashions, clothes repair and dry cleaning. The galerie is notable particularly for its grand and vintage glass roof and original architecture. Nearest metro, Sentier. This is a brightly lit and enticing classic galerie. There are shops selling long lost postage stamps and a fascinating shop called Tombees du Camion. This phrase translates as ‘fell off the back of a lorry’. This emporium sells everything from frightening plastic dolls to kitsch postcards. Go to one of the fashionable wine bars to get your breath back. Nearest metro, Grand Boulevards. The passage is in state of serious disrepair but the classic art deco features are pretty. It lies in a fascinatingly cosmopolitan district of Paris. It is home to numerous barber shops and hair salons and visitors can enjoy sumptuous cuisine in a café that specialisies in dishes from the island of Mauritius. Get off at the metro, Strasbourg Saint- Denis. This galerie is a little off the mainstream Parisian cultural track but is a classic senior relative of the family. View the splendid architecture, mosaics and sculptured statues that were created in 1873. They have all been caringly preserved. Jean-Paul Gaultier opened his first boutique here. You’ll find the contemporary designs of Didier Ludot and the fabric establishment of Wolff and Descourtis. Discover what could perhaps be the finest wine shop in Paris called Les Caves Legrand. Bistrot Vivienne and A Priori are prefect for a meal, afternoon tea French style, or aperitif. The nearby metro is Bourse. Bob Lyons is an ex pilot turned travel writer who adores Paris and France.